EDITOR'S NOTE: Empire Lakes Golf Club has closed. The Empire Lakes Golf Club is well-known throughout the area for its emphasis on accommodating private outings, charity functions and various tournaments, but nothing can top the event coming this fall. The BUY.COM Tour, formerly the Nike Tour, will bring its collection of aspiring professional golfers to the course for the Inland Empire Open at the end of September. This event might clue other golf enthusiasts in on what the locals already know - this Arnold Palmer design is one solid test of golf. "We like to hold a lot of tournaments," said Empire Lakes General Manager Michael Lautenbach, who added the tournament has been signed for three years. "It's sort of a service we provide the community to give back to them." 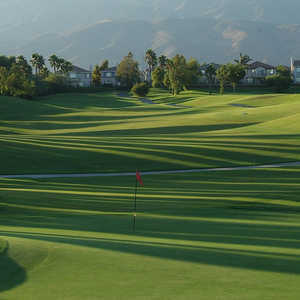 The course, located on 160 acres about 40 miles west of downtown Los Angeles, is easily accessible off the Interstate-10 freeway in a rapidly developing area on the fringes of L.A.. It opened in January 1996 and continues to mature. The tour players will certainly be challenged from the black tees, which play to 6,923 yards, but Palmer designed the course to make the experience enjoyable for all. While playing from 6,628 yards from the blues, the course plays a gentle 6,024 yards from the whites. In the course's brochure, Palmer says: "I am really excited about our design for this championship golf course. It features four lakes that come into play on six of the 18 holes, and greens that are protected by fingered bunkers. 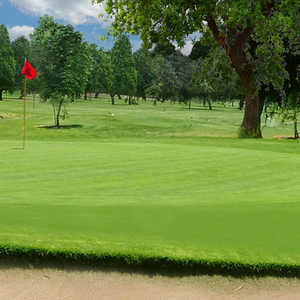 This course will provide you with an exciting golfing experience." The course is relatively flat, but the rolling fairways and some fairway mounding and long, shaggy rough can play tricks with any lie. Without much elevation change to bother a golfer's scoring ability, Palmer made most of the par-4s and par-5s into dog legs, so you're never really aiming directly at any green off the tee. This makes strategy and positioning off the tee even more important. Except for several holes on the property's perimeter, there aren't many out-of-bounds areas to worry about. Many of the holes run parallel to one another, separated only by the mounding. A stray ball might land in your fairway from time to time, but it isn't a major problem. The course only holds 33 bunkers, but it seems like more. Many of the bunkers are large and their finger-like projections stick out every which way, keeping sand in play from all angles. As the course's trees grow bigger, the course will get even tougher. The greens are fair and seem to roll true. Most are flat with some undulation, but several do have large ridges with which to contend. The small man-made lakes are the course's real hazards, though. They come into play on six holes, including the tee shots on No. 1, 2, 3 and 7 and on the approach shots of No. 3, 9 and 18. The first hole greets golfers with a short carry over water to a skinny fairway that bends right between severe mounding on each side. Get a couple good warm-up swings on this hole to get ready for No. 2, a 153-yard par-3 over water. No. 3 might be the most interesting hole on the course, although it plays just 320 yards. The hole bends to the right with water short of the fairway and up the entire right side. If you find dry land to the left of the fairway off the tee, don't relax because any erratic iron shot might also take a plunge. A beautifully landscaped waterfall short of the fairway also enhances the hole's personality. The 407-yard par-4 closes the front nine with a testy approach shot. The lake from No. 1 lurks left of the green. No. 11 is certainly one of the longer holes you'll ever play at 601 yards from the back tee and 576 yards from the blues. The back nine doesn't quite live up to the front nine's high standards, but the spectacular 18th hole might make up for any shortcomings. The fairway starts left, then jogs to the right around the lake at about the 250-yard mark. Four bunkers within 75 yards of the green will grab any conservative attempt to avoid the water on the right. It's a sure bet this hole has decided many a tournament outcome. Green fees are a respectable $55 Monday through Thursday and $80 on Friday-Sunday and holidays. Twilight rates are $35 (Mon.-Thurs.) and $50 (Fri-Sun.). Senior rates of $35 only apply Mondays and Tuesdays. With 10 minutes between tee times, not the standard seven minutes between foursomes, the course usually has a decent pace of play and usually isn't jam-packed with golfers. Lautenbach said he takes pride in every aspect of Empire Lakes. "We try to provide the best quality golf, that's why we stand out," he said.